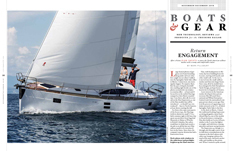 Large framed photos of gorgeous new boats bounding along under sail were what first caught my eye when I walked into the Springline Yacht Sales office in Mystic, Connecticut, one morning last August. No surprise there. But the pair of shapely downhill skis standing right beside one of the photos seemed a bit out of place in a marina office — at least until I focused in on the stylish Elan logo stamped on their flared, rounded tips. I was there, after all, for a test sail on the Elan Impression 45, one of the Elan models that will be introduced — or should I say reintroduced? — here in North America at boat shows starting this fall.